If you read our last post, called Summer Plans, you know that we will be spending our summer in Northern Minnesota at Grand Portage National Monument. We'll be costumed interpreters in a living-history site. Most people who have heard about our plans say two things: First is something about how "you will really enjoy that" and second is "expect the mosquitoes to horrific." As for dealing with mosquitoes, we'd like to hear ways to deter them that have worked for you. We will probably use a variety of methods, including bug spray, brewer's yeast tablets, and electronic repellents. Let us know what's worked for you. As we slowly work our way north, we decided to stop in Santa Fe again. We had been in Santa Fe about a year and a half ago, in September 2017. We stayed a week and really liked it, although we couldn't put our finger on exactly what it was about Santa Fe that we liked so much. Perhaps it had something to do with all the local art, or the great museums, or the natural beauty that is nearby. We're not sure. We also have different recollections--Jane remembers the week as being mostly rainy, while I remember it being sunny a lot. In any event, we decided that we liked it well enough to return for another week. And as last time, we found more things to do here than we can fit into one week. Here's the kiva in the foreground with the preserved partial remains of the mission church in the background. Glorieta Pass was also the site of a Civil War battle. We don't often think of the Civil War in the southwest, but the Confederacy had sent troops to capture Santa Fe, with an eye to taking California and having a port on the west coast. The Union sent forces, and the two groups met at Glorieta Pass. After a brief indecisive battle in which the Union troops retreated, the Union sent a detachment through the mountains to destroy the Confederate supply wagons. Once the Confederates saw that their supply had been destroyed, they retreated and fled back to Texas. That was the last Confederate incursion into the west, although rumor has it that their flag is still alive and well in Texas. 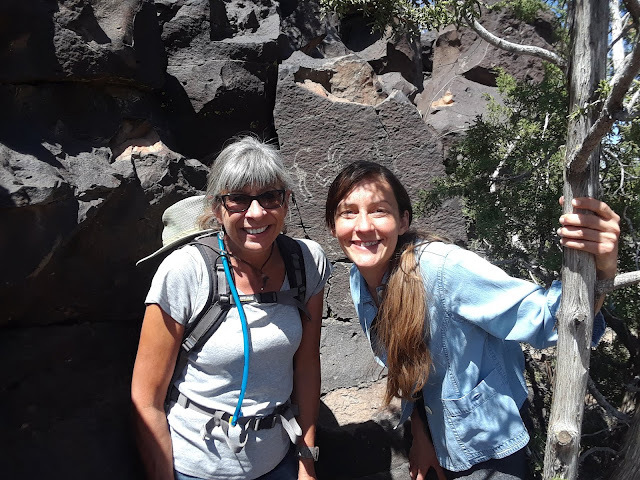 Our second interesting excursion near Santa Fe was to a collection of well preserved petroglyphs on BLM land. We visited the site with a friend from our Wheaton days, Suzanne Teune. There's just a bit of trail here to get you to the base of a small cliff. Basically it's an old volcanic lava flow that has eroded on one side, leaving a nice flat black rock face upon which the ancient people who lived here carved the images. There's no real trail, just worn areas where others have gone. And you're on your own for appropriate behavior--not touching the images, no taking rubbings, or making your own scratchings. This is one of the few places where you see multiple images of Kokopeli, the flute player.The photo above is a pretty good example. This image of a Thunderbird is very recognizable. We're not sure what this is meant to represent, but it's very clear and distinctive. Perhaps a bird as a "jack-in-the-box" toy? Here's our flute player again, this time being stalked by a snake. And this strange image looks like a jellyfish. While the ocean is far far away, we do know that these people traded goods with people from Central America, so it's entirely possible that they knew what a jellyfish looked like. We've visited Santa Fe a couple times now, each time for a week. And we find each time that there is more to do than we have time for. Maybe next time we'll have to stay longer! In part 2, we visit two more nearby National Monuments: Kasha-Katuwe Tent Rocks and Bandelier. Living life on the road is a bit different from living in a house in a neighborhood. I think it's best described as "being always on vacation and always at home". Our winter time, however, is still quite different from our summer travels. 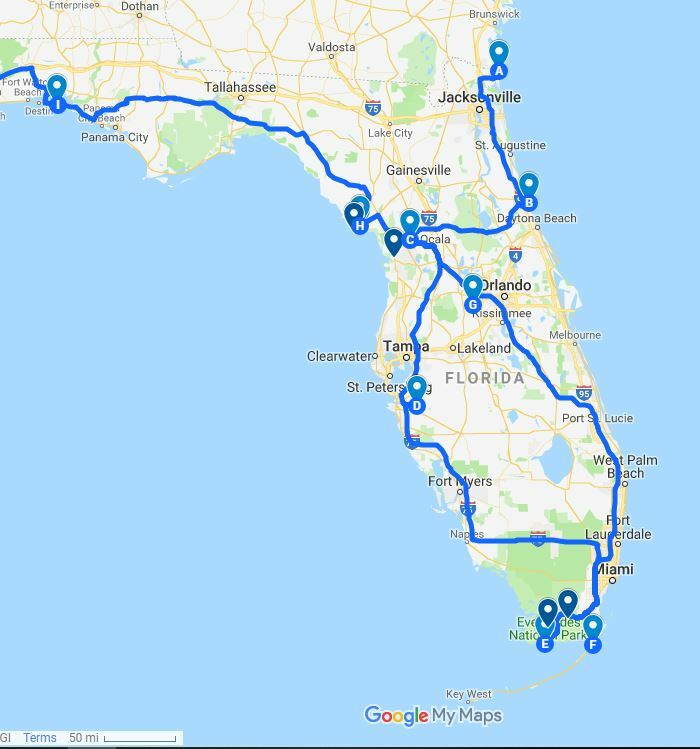 We spent our first winter in Florida and stayed in a bunch of different locations, most of them for two weeks at a time, with a month-long stay in Cedar Key. The past two winters, we have stayed in Tucson, Arizona, at a large park with tons of activities. We call it "summer camp for seniors," and we stay for four or five months. We have a lot of friends in the park now, and we're involved in a local church that we really like. So it seems pretty likely that we'll be back here for a few more winters. Summertime, however, is our time to travel and see things. 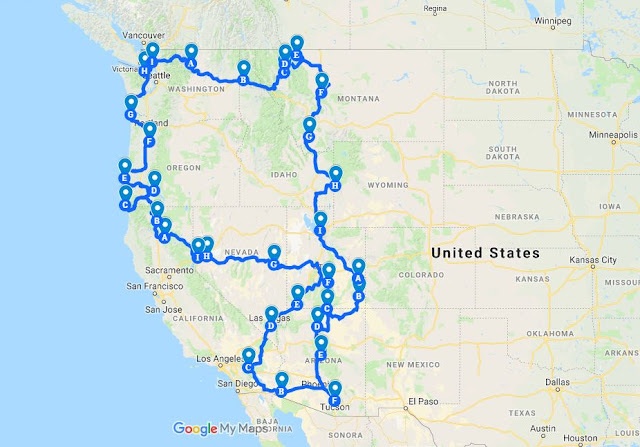 Here's where we went in the summer of 2018, primarily in the west, with about 12 weeks in Washington and Oregon, mainly on the coast. After leaving Tucson, we were in 32 different locations. By the end of our summer travel time (end of October), it was starting to feel like just too many moves. Granted, we got to see a ton of cool places and wouldn't trade that for anything. But we started to think about ways to do a bit less of continuous travel, while still having interesting things to see and do. We decided to look into the possibility of a volunteer gig for the summer months, taking a couple of months in the spring and a couple of months in the fall to travel. When you start looking at volunteer gigs, you first need to decide whether to look at state/national parks or private parks. Working at a private park is more like having a job--and many of them pay a wage in addition to providing a free site. We're really not interested in working a regular job anymore, so it would have to be something special to get us interested. At state and national parks, there are lots of openings for campground hosts. These are the folks who help the rangers with a variety of tasks around the campground, often selling firewood but sometimes also cleaning toilets. This doesn't really appeal to us either. But we did come across a request for volunteers that looked interesting. Grand Portage National Monument was in need of volunteers to be costumed interpreters at their living-history site. Grand Portage is in northern Minnesota, on Lake Superior, just south of the Canadian border. It has been a gathering place for Native Americans for centuries and was the location of a major fur-trading site in the late 1700s. The depot is at the junction of the riverways of Minnesota (where you could paddle all the way to Winnipeg) and the route of the sailing ships that crossed Lake Superior. We applied, but as it was during the most recent government shutdown, we had to wait until that was resolved to hear whether we would be considered. Eventually we did hear that they were still interested in us (three other couples had been hired before the shutdown), and we interviewed by phone in early March. Soon after we found out that we were selected, and we began making plans to get to northern Minnesota by early May. Or she might appear to be working on an off-shore oil platform. If you want to visit us there, here's some logistical info. We'll be there from May 13 to Labor Day. Our first two weeks are training weeks, with our real volunteer activities starting Memorial Day weekend. 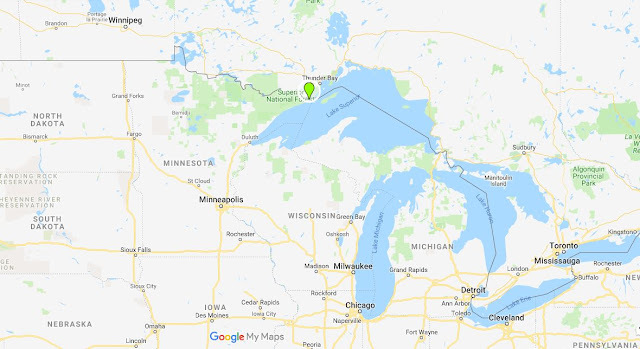 There's no campground at Grand Portage NM, and the nearest town is Grand Marais, about 35 miles south. There is an RV park at the Grand Portage Lodge and Casino in Grand Portage. We tend to forget just how big Lake Superior is; Grand Portage NM is located way up along the northwest side of the lake. It's over 600 miles from Chicago and around 800 from Grand Rapids, MI. We'll have a bunch of studying to do to get up to speed on the history of the place and the cultures that interacted there, but we're still waiting for that shipment of books to arrive. Watch for updates as we learn more! This is our second winter in the desert. For people who grew up in the Midwest with pine and maple trees, the desert flora is a bit different and it takes some time to get used to it. The desert has a beauty all its own, of course, and it's not always the same.There are flowers that grow in the desert, but you don't often get to see them. They don't bloom every year, rather they only bloom when conditions are right. Those conditions require sufficient rainfall, but not just one or two rains, but a series of rains over a certain length of time, with the right amount of sun and warm temperatures. When those conditions occur, the desert can spring into bloom, perhaps for the first time in many years. This year, the conditions were right.We had planned a trip to southern California to see friends and Jane's uncle and aunt, and just happened to go when the desert flowers "super-bloom" would be peaking. So we came back to Tucson via the Anza-Borrego State Park. I'll let the pictures speak for themselves. Lots of these moths that look like butterflies. Unfortunately they make a huge yellow splat on the front of the car. Barrel cactus in bloom. Not a real unusual sight, but nice when it's at the right height! Or, "Not Too Hot, Not Too Cold, but Just Right." Or "Always Something New." We recently made our third trip to the bottom of the Grand Canyon. We first went in 2014 as part of a rim-to-rim backpacking hike in early June. Early June is pretty hot at the bottom of the Grand Canyon--107 degrees Fahrenheit to be exact. Our second trip was in January of this year, when we scored a last-minute cancellation at Phantom Ranch. We were at the Grand Canyon again in October, on our way back to Tucson for the winter. When we were making our fall plans, we saw an opening at the Grand Canyon trailer village in October for six nights, so we grabbed it. This being the only RV campground in the park, it fills up way in advance, so if you see an opening, you'd best take it. The last time we stayed in the trailer village, elk came through the campground every evening. 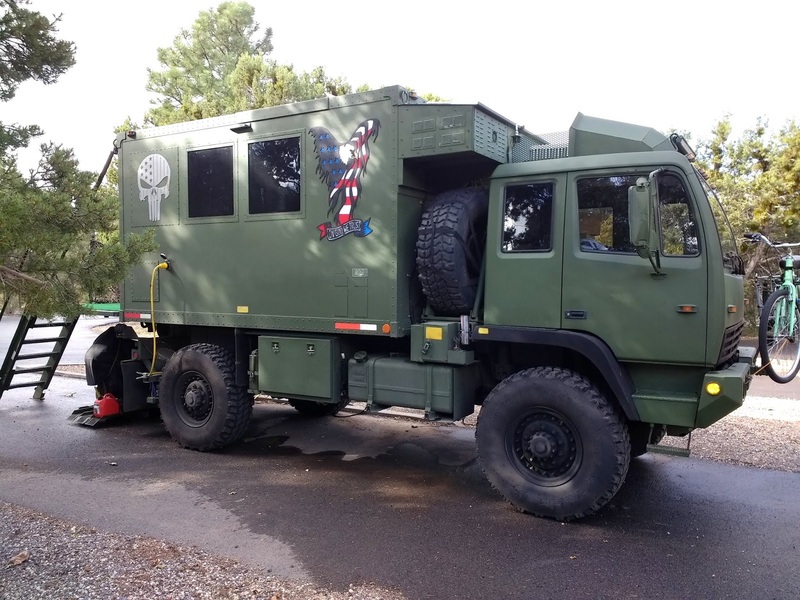 No elk this time, but there's always something new to see, like this RV built on a M1078 military truck platform. The day after we arrived at the canyon, I checked online to see if there were any openings at Phantom Ranch. This was on a Thursday, and there were openings in the dorms for both Sunday and Monday nights. After reviewing the weather report, we booked it for Monday night. Now, you may know that it is extremely difficult to get a reservation at Phantom Ranch. It books up 13 months in advance, and demand is so high that there is a lottery. We met people on the trail who had tried unsuccessfully for 2 1/2 years to get a reservation at Phantom Ranch. But as it turns out, the mules that take riders to the bottom had gotten sick, and the park had to cancel the mule rides for a couple of days. This left some spots open in the dorms at Phantom Ranch, and we took advantage. If June is hot, and January can have snow and ice at the rim, October should be just right. And the temperatures were pretty much just right for hiking: around 60 F at the rim and mid-70s at the river. But we were also dodging rain and thunderstorms this time. Fortunately it never rained very hard on us, although we could see rain not too far away. And the thunderstorms were around 10 miles away. 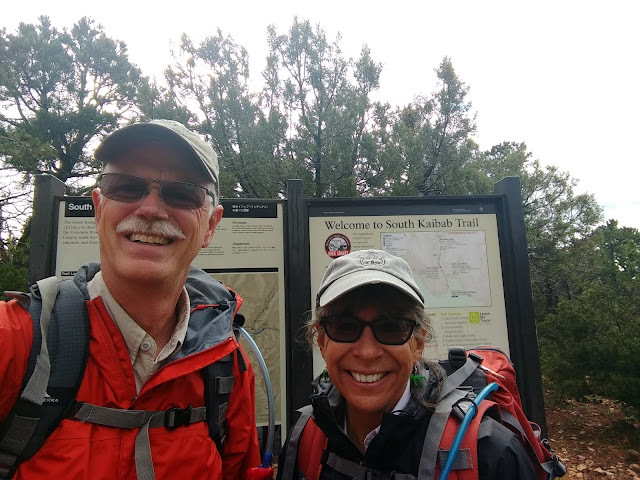 Nevertheless, we did not stay on the ridgeline of the South Kaibab trail any longer than necessary. Sometimes we could see a rainbow below us, and sometimes we were hiking down into the clouds. Also new for us this time was the color of the Colorado River. 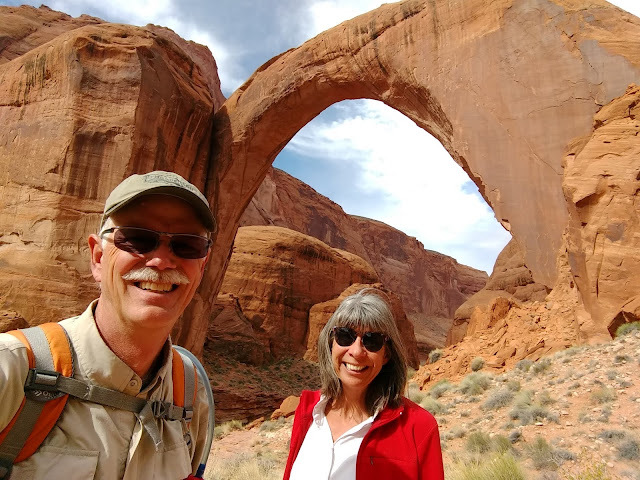 We had been in Moab, Utah, earlier, where we had five days of rain. And there had been significant rain in Arizona and Southern Utah in October--5.5 inches in Phoenix, for example. This meant that there was lots of run-off water carrying the dark red dirt, which turned the Colorado from it's typical green color to the color of chocolate milk. Here's a pic looking down at the beach near Phantom Ranch where the rafters all stop. Even Bright Angel creek, which gets most of its water from roaring spring, was looking pretty muddy. Another new sight for us this time was this rather large spider we encountered on the trail in Phantom Ranch. I think it was probably a tarantula, but I wasn't going to get close enough to find out for sure. It was about the size of my fist. And it didn't seem to be too scared of us. Also new on this hike was the amount of green in the canyon. 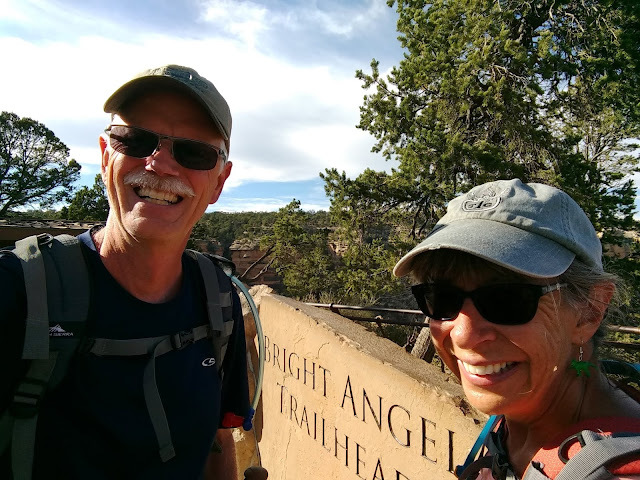 Thanks to all the rain, there was green grass growing all along the Bright Angel trail. We joked that the rangers would need to start mowing the lawn, and rangers that we met commented that they had never seen so much green in the canyon. The final new thing we saw in the canyon on this hike is something that was old and is new again. We came across someone taking pictures with a 4x5 view camera. Most people we see take pictures with a smart phone or a digital SLR. A few use a tablet, and we like to use a pocket digital camera. But you rarely see something like a 4x5 view camera. This is not an old camera, but a modern incarnation of an old design. It uses film, not digital image capture. And it's the format used by the professional photographers whose photos sell for thousands in art galleries across the west. I guess that nothing can match the level of detail that you get with this type of large-format camera. The young man operating the camera, Drew Nikonowicz, owns the company that makes them and was returning from a convention in San Diego. He had not been to the Grand Canyon before and had just come a mile or so down the Bright Angel Trail to take a few pictures from a different perspective than you get on the rim. I'm sure he got some good pictures, and he'll probably return someday. If you want to read more about the cameras that he makes, go to Standard Cameras, I think you'll find it fascinating. When we did our rim-to-rim hike, people told us that we would likely return to the bottom of the canyon, as there's always something new to see. We saw many new things on this hike, just as we did on the last. We now know that October is an ideal time to do this hike, at least for the temperature. And we know that we can expect to see something new each time. Will there be a next time? If so, what will we see?